I recently revealed a long standing guilty pleasure of mine. True confession: I love watching makeup hauls and beauty tutorials on YouTube. Off and on over the last several years I will go through phases of being completely obsessed, actually. I'm only embarrassed of this because my favorite ones are usually made by girls half my age. (I'm only slightly kidding.) I don't know what my weird fascination is with makeup, considering I hardly wear any myself. I always love admiring "done up" girls who "put their face on" every day. My regular routine is simple, quick, and natural. It works out perfectly that my husband prefers this (or so he says). Usually my go-to beauty splurge is on nail polish but this month I've tried quite a few new products so I thought I'd share some reviews. ParloCostmetics is a mineral makeup line -- "Infused with skin pampering powders and jojoba oil to give you luxurious application and long-lasting results. 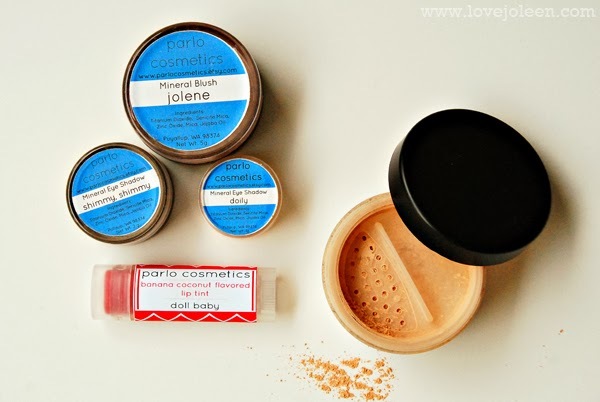 No parabens, no talc, no fillers, no harsh chemicals, just simple and beautiful minerals." In my early 20's I was bitten by the MAC eyeshadow bug and every "extra" $11 I could rustle up would purchase some new, outrageous color. These days, I mostly stick to a neutral color palette (although I would love to learn how to give myself a great smoky eye without looking ridiculous). I couldn't decide between Shimmy, Shimmy and Doily, so [the owner], Chrissy, was kind enough to send me a sample of the latter. I was nervous about selecting the right shade but in the end, I choose the Light Beige Mineral Foundation. Lastly, I choose three Lip Tints in Tart, Cheeky, and Doll Baby. So, what did I think? Overall I was very impressed. This makeup line is totally affordable (major plus!) which gives you flexibility to experiment. Best of all it's high quality! I have to be honest and say that I was not expecting much. The only thing I honestly didn't care for, were the lip tints. 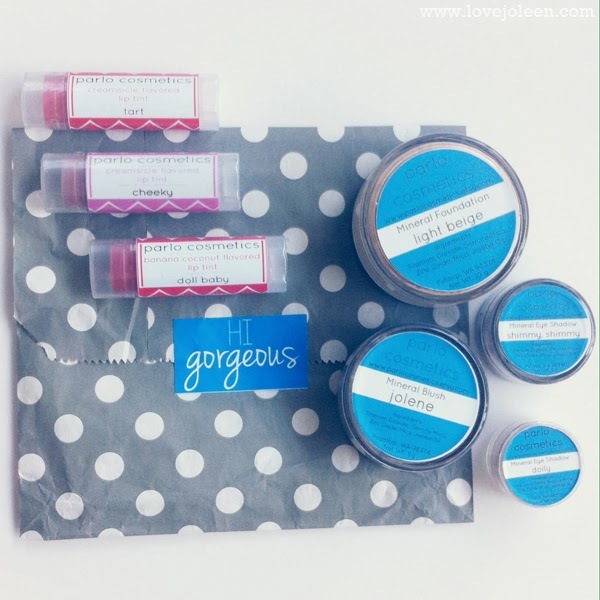 I am somewhat of a lip product snob and I have very specific needs. 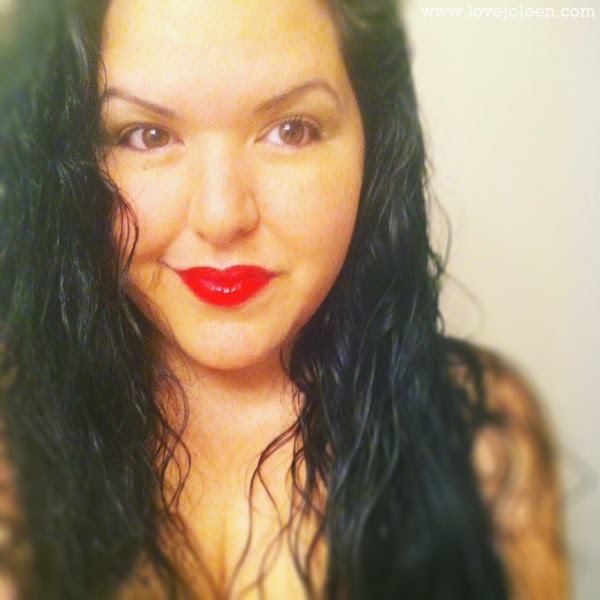 I like great color as well as moisture, and it's not often that you find both in one product. With a lip tint, I expect it to be moisturizing since it's focus isn't on color as much. That being said, I did like the colors a lot! I just found these to leave my lips feeling dry (unless I applied chapstick first) and one of the sticks itself started to disintegrate after only a couple of uses. I had no prior experience with a mineral foundation and found the description itself to be an oxymoron. I was so wrong! Coverage is build-able so all you have to do is apply a couple quick layers "to diffuse imperfections and give an overall radiation glow." I loved the way it felt on my skin. I have dry skin so I was skeptical that a dry foundation would work, but it does, so this is all I'm using right now! The pigments in the blush and eye-shadows are equally as outstanding. I am really looking forward to building onto my collection! 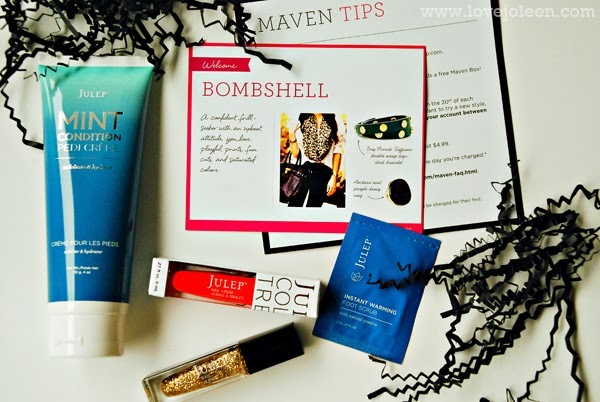 This month I received my first Julep Maven Box! I've been wanting to try this nail polish for a while now and recently came across a coupon code for a FREE BOX (which is subsequently the actual code, minus the space. *wink wink*)! All I had to pay was shipping. Sold. You take their short quiz to "discover your style profile" and then they ship you a box. Easy peasy! I was excited to try out the beauty products they sent me. I received two foot products: a full size Mint Condition Pedi Crème (not currently found on their website) and a sample of the Instant Warming Foot Scrub. I liked the latter a lot. It warmed up instantly and left my feet soft. I didn't love, love the foot crème. I do like anything "mint", so it does smell nice. It is initially hydrating like it claims, but five minutes later I feel like I need to put on real lotion! I think, in the future, I will stick to Mentha Foot Tingling Foot Cream from Bath & Body Works. I mentioned my typical beauty product splurge is nail polish. When I say "splurge" I don't mean I spend a lot, I just mean I purchase a lot of inexpensive shades. Nail polish is like the "shoes" of beauty products - it looks good on everybody and you can rarely go wrong. It's the one area that I like to get crazy with. Pre-baby I used to paint my nails all the time. It was the way I relaxed and I would sometimes change my polish two or three times a week (see here, here, here, and here). Now, I'm lucky if I paint my nails once a month. In the Fall, I like GOLD GLITTER! I can't tell you how many variations of gold glitter I've tried! Remember when I put gold [crafting] glitter over clear polish? I have officially discovered the MUCH less messy version: Julep's Oscar over Sally Hansen's Golden-I. It is absolutely TDF. I promise you will thank me later. I loved both nail polish colors they sent Oscar + Madison. They describe Madison as a "electric neon hot pink crème" but I will say it's a little on the coral side versus hot pink. It's opaque and slightly see through but I actually really like that about it. In the end, I definitely wouldn't subscribe monthly because I find subscriptions start to feel like a giant waste of money. I would, however, love to buy the polishes from time to time. More and more I am coming across raving reviews regarding the inexpensive makeup brand, e.l.f., carried by Target. Supposedly, they maintain designer quality standards, while saving costs on packaging. I've been purchasing e.l.f. products for years. I've used a few of their Tools, Tinted Moisturizer, Studio Precision Liquid Eyeliner, and Studio Blush. I've purchased their Eyeshadow Palette for one of my sisters, an Essential Beauty Book (although not this one) for myself, and a Shiny Lip Gloss Set to break up into stocking stuffers. Every single time I have been pleasantly surprised by the quality at such a low price. This time I picked up the Volume Pumping Mascara for just 3 bucks. I don't think it's THE PERFECT mascara but I did really like it. They have several different variations, so I'll definitely try others. I really like it as a second coat to Covergirl's LashBlast Volume Mascara. In sticking to my gold theme (obsessed much!) 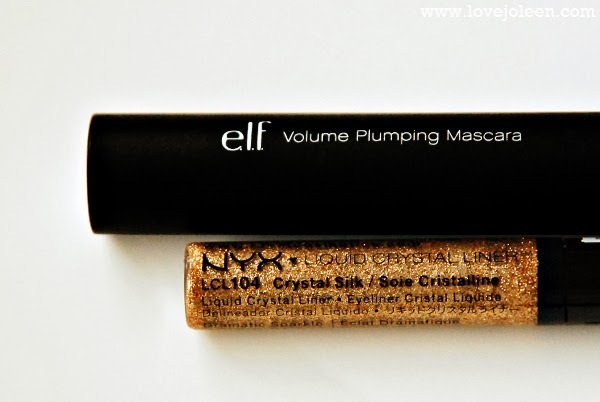 I had to try this NYX Cosmetics Liquid Crystal Liner in "Crystal Silk". NYX Cosmetics is also an inexpensive drug store makeup line, and this particular eye liner can be found for $4.50 at Target. The actual product is simple to use. It's glides on easily, without clumping, and the glitter looks great! The color is vivid and sparkly. I had two problems with it. The first, was that after a few hours of wear it peels off. If you're just wanting to wear this to a fun dinner or costume party then awesome! If you're going out, you'll probably sweat it right off and down the side of your face. Not cute. The other issue saddens me because it means I can't wear it. Period. I'm pretty sure I'm allergic to it. I've tried wearing it three times because I love it so.. but each time it makes my eye lids a little puffy and my eyes sting. Benjamin (the husband, not the son) says I have to discontinue use. Womp womp. Still with me?! My most recent purchase was from The Body Shop and I am probably the most excited about this purchase. The truth is that my beauty cleaning regime is seriously lacking. Back in January, I told you that I had started using Raw Honey and Coconut Oil to wash and moisturize my face and I honestly still swear by that! I love what it has done for my skin. I also use coconut oil on Benjamin, after his baths. He's super soft and smells good enough to eat. (Isn't it weird that I don't actually like the taste of actual coconut?) Still, I wanted to try to find something that would still be gentle on my skin, but give me a deeper cleaning from time to time. I mentioned before that my face tends to run on the "dry" side, especially in my T-zone. I was attracted to the Vitamin E Skin Care Line because of their boast that Vitamin E "gives long-lasting hydration and helps protect against environmental damage." This is my first experience with a cream wash and this particular one is not only hydrating but it smells good too! I've only used these products a few times so far, but each time they've left my face feeling soft and moisturized. 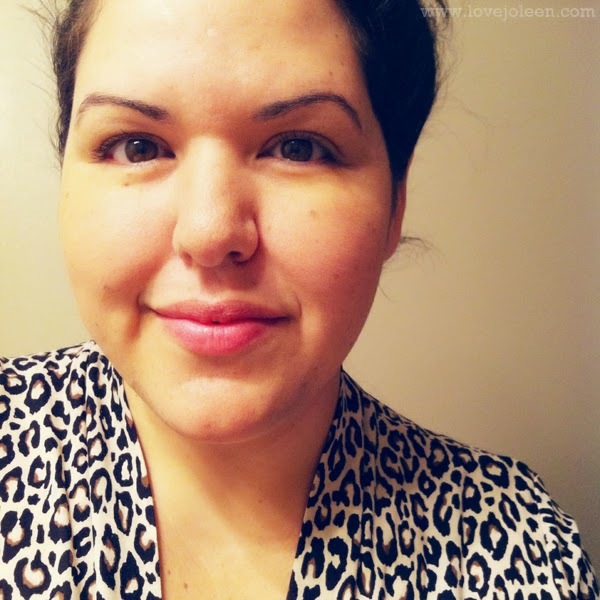 I'm always weary of new products irritating my super sensitive skin, (I'm even allergic to Aveeno products) but did not have any issues with itchiness, redness, or puffiness. I look forward to seeing the prolonged results! Lastly, on a whim, I purchased a bold, red lipstick and liner. I'm not sure what drew me to it since that's about as far from "natural" as you can get, but I had to have it. I have never owned a true red and it just seems like something a 30 year old woman should have. (True story: when I had Benjamin last year that was the first time I had ever painted my nails red.) I think I was probably inspired by this soon to be mama! Anyway, I purchased Rosy Red Lip Liner and Enraptured Red (matte) Colour Crush Lipstick. I do love it but I'm not sure when I'll actually wear it. I took it off right after taking this photo. I just don't feel confident enough to wear it in public yet. 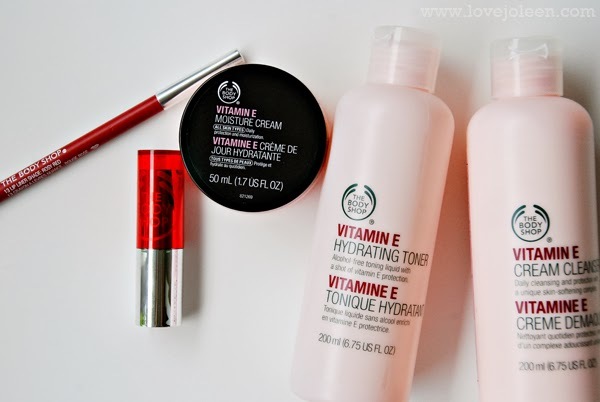 By the way, The Body Shop is having a sale right now -- buy three items, get two free. I purchased all of the above for just over $40, including tax. So there ya go.